This is considered important not only by the government of Armenia and the United Nations World Food Programme (UN WFP), which have launched the initiative, but also by parents and teachers of those children who benefit from the program. The Sustainable School Feeding program carried out within the framework of the UN WFP, which was established in the second half of the last century and adopted a mission of saving lives in emergencies and building capacities for the fight against hunger, officially launched in Armenia in 2010. The program intends to improve pupils’ feeding and health, as well as enhancing their learning capacity. The donor of the program is the Russian Federation. The School Feeding program in three provinces of Armenia – Ararat, Vayots Dzor and Syunik, has been financed by the Armenian government, and in other provinces, with the support of the WFP. 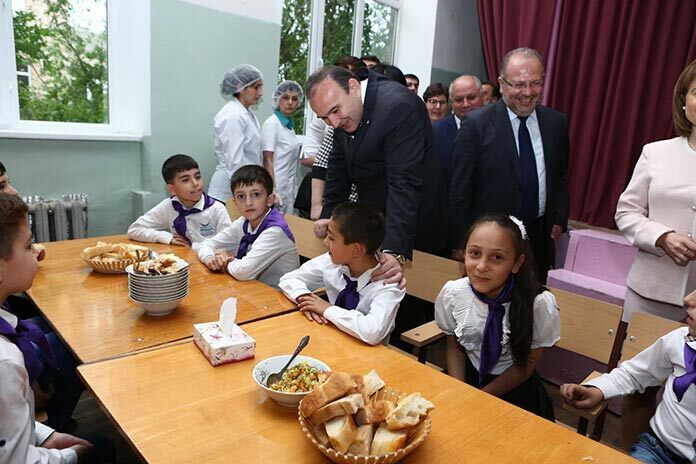 On Tuesday, Levon Mkrtchyan, the Minister of Education and Science of Armenia, and Pascale Micheau, the WFP Representative in Armenia, visited schools in the Ararat province to learn about the process of the Sustainable School Feeding program. “In the social situation of our country it is an important issue, especially when the public is generally satisfied with the program. In addition to nutrition, the program also has an educational value. The program creates discipline within children and a culture of sharing meal with a friend. I noticed that all children collect their plates, so this is also an instance of upbringing. The program should be continued and we should try to apply it to students above the fourth grade,” said Mkrtchyan, adding that every year they will try to involve other provinces in the program, too. According to him, particularly this year they are planning to extend the number of provinces (currently three) funded by the government and involve the provinces of Tavush, Shirak and Aragatsotn. An important prerequisite for implementation of the program in schools is the existence of kitchens and maintenance of sanitary norms there. The organization of school meals is under control of councils of provinces. A sum of 140 drams (about 70 cents) from the state budget is daily allocated for each child, 120 drams (about 60 cents) of which is intended for food, whereas the rest is for organizational work. The government does not provide a position for a chef at schools, and the problem is solved with the assistance of parents in many places. However, the minister is hopeful that if they make certain changes in school staffs the issue will be resolved. However, this program is not unequivocally accepted. A mother of two children from the town of Sevan town, who wished to remain anonymous, told ArmeniaNow that it would be preferable if the program was optional. “One of my children has health problems and a strict diet is appointed. My child cannot eat everything. I have asked the teacher several times not to take my child to the canteen at lunch time, but there is a problem: every month I should provide an appropriate document from a doctor. But why should I do that? I understand that for many families who are barely making a living, this program is very important, but I do not want my child to go [to the canteen], let them leave it at the discretion of parents,” complained the woman.